Newport RI Day 2 - Enjoying more stunning scenery in the "City by the Sea"
More stunning scenery in the "City by the Sea"
I rented a bike from Scooters of Newport on Thames Street. It cost $70 for the week. They also rent "Scoote Coupes" and a variety of scooters. I figured since I'd be eating well on this vacation, I might as well get in a few bike rides to burn some of those calories. 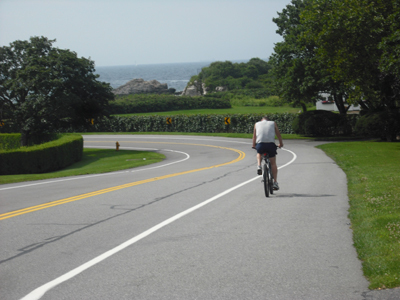 And there's no better place in Newport to go for a bike ride than the stunning Ocean Drive. 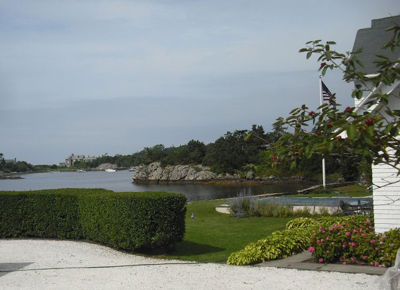 I started off at the intersection of Thames Street and Wellington Avenue, and passed many Newport RI attractions (King Park, Ida Lewis and New York Yacht Clubs, Fort Adams) along the way. 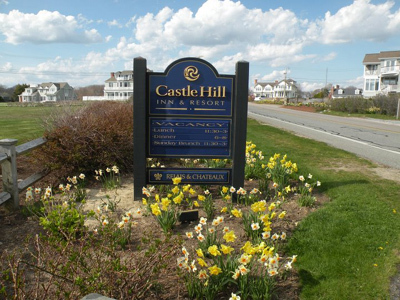 After about 3 miles, the really breath-taking scenery starts just past Castle Hill Inn and Resort on Ocean Avenue. On the right, just after Castle Hill, there's a grassy area where I stopped for awhile. 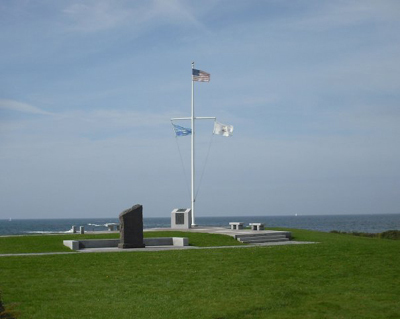 This is a great spot to take a break and enjoy the cool ocean breeze and view of Narragansett Bay. 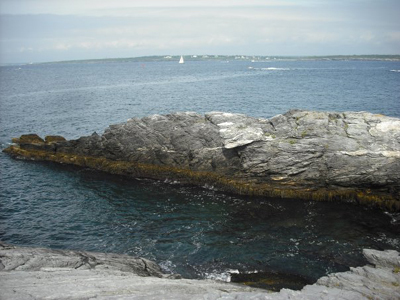 If you really need to cool off, you can walk down the rocks (just be careful, they can be slippery) and dive in for a quick dip. 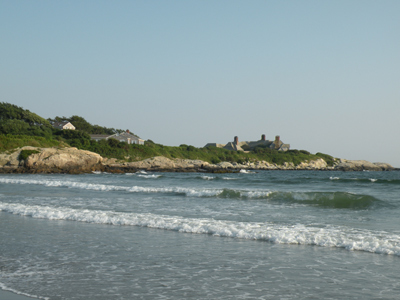 To the left, there's a small beach area where some people go instead of the crowded Newport RI beaches. 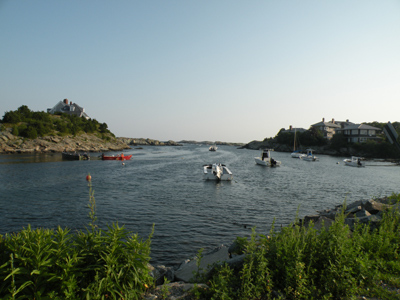 This is also a spot where people come to fish. As I continued along the road, I came upon Brenton State Park on the left. 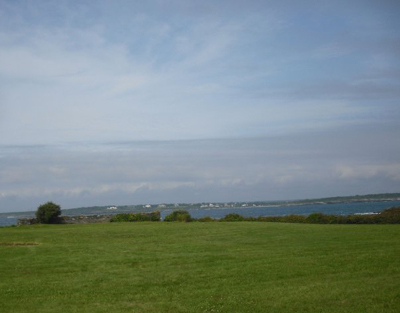 This park is a popular place for kite-flying and cookouts. Many people park their RVs here all day (the park is open sunrise to sunset) and watch the waves crash into the rocks just across the street. 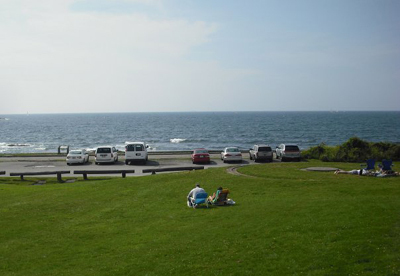 Parking is free, and there is plenty of room to spread out with your family and enjoy an entire day here. There is no concession stand or food service here, so be sure to load up a cooler of your own. If you like lemonade, there is almost always a Del's Lemonade truck stationed in the parking lot. 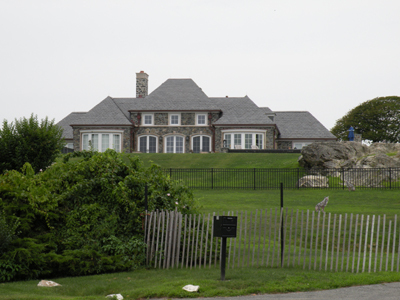 As I continued my bike ride, I came across many amazing homes with ocean views to die for. .....and others, not so much. Not a bad view to have from your back yard! 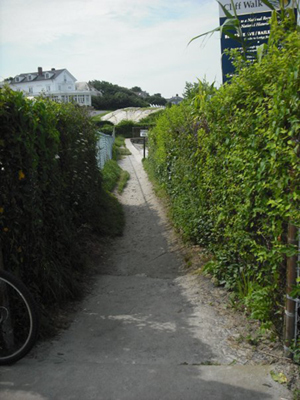 As I continued my bike ride, I passed Hazard's, Gooseberry and Bailey's beaches. 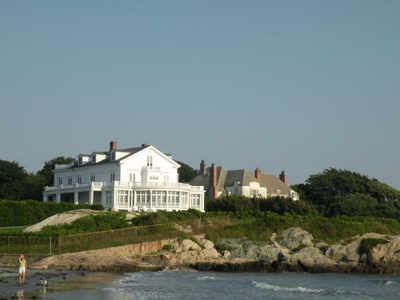 Bailey's Beach is where the elite families used to (and still do) bathe during their summer visits to Newport. If you take 2 rights just after Bailey's Beach, you'll come across a path that'll take you down to what the locals call Reject's Beach. 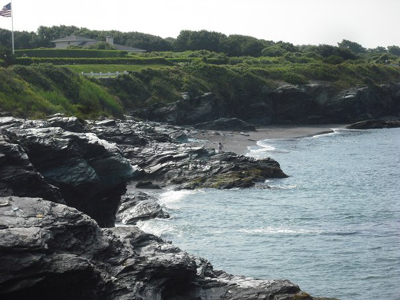 This small beach is a great alternative to the larger (and more crowded) public beaches. The waves aren't bad, and the water here usually has less seaweed than the other beaches. 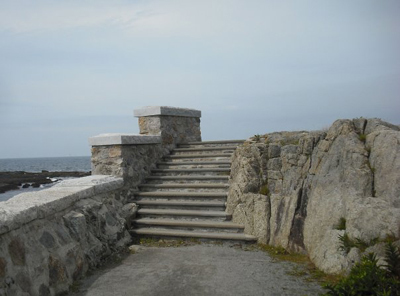 This is also the end point (or you can start here if you like) of the famous Newport Cliff Walk. If you haven't walked at least a portion of this beautiful 3.5 mile trail, put it on your to do list. 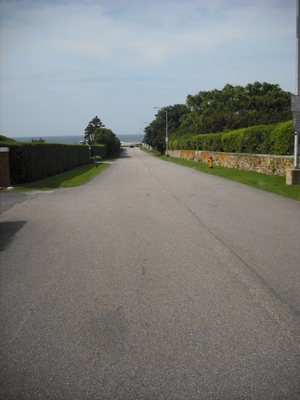 By this point, the Ocean Drive has turned into historic Bellevue Avenue. 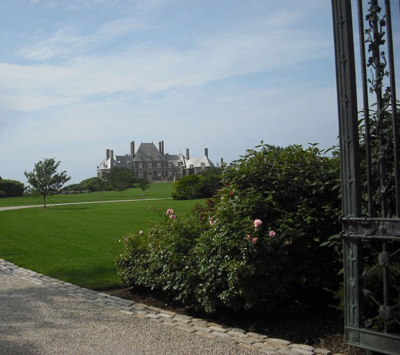 Before you get to the Newport mansions, take a right onto Ledge Road, where you'll encounter another access point to the Newport Cliff Walk. 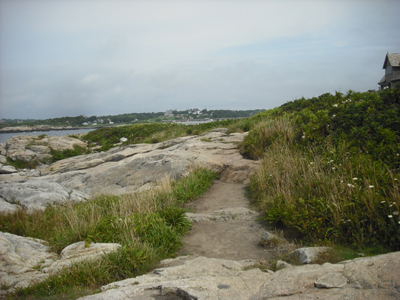 At the end of the road, you can go left or right and see more of the Newport Cliff Walk. 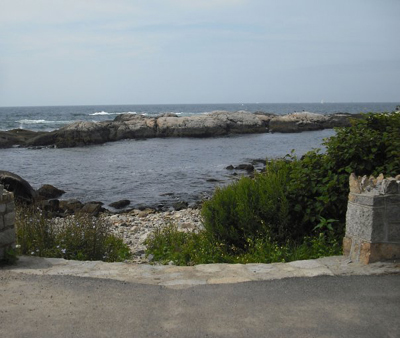 No matter how many times I come out here, I am always amazed by the beauty of this historic, 10 mile drive. 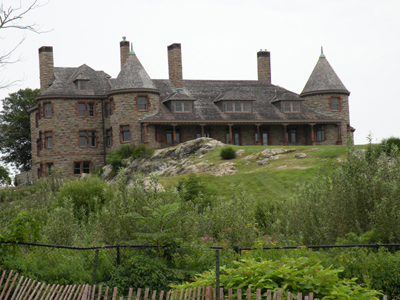 I'm sure you will be too when you get a chance to visit Newport Rhode Island.